I guess I was thinking this book would be more like Russ Parsons' How to Read a French Fry, a great book about cooking. It made the mundane wonders of baking powder and frying seem terribly interesting and elevated your dinner to practically a scientific miracle. I am probably jealous of Michael Pollan's opportunities to travel the world seeking out food artisans, order rockin' fermentation crocks at the drop of a hat, and have cooking lesson house calls from a former Chez Panisse chef. It is his going to these extremes which bothers me the most. Much of his writing to date has been lamenting that Americans have stepped away from the kitchen and into the loving embrace of Betty Crocker and Uncle Ben. I was right there with him. However, indulgent cooking/travelling projects like those going on in Cooked set the bar too high. I recently had occasion to talk to a college student about how I got started with cooking. My beginning kitchen kit was a two-quart saucepan, a ten inch cast iron skillet, a wooden spoon, an 8x8" Pyrex dish, and a crappy paring knife. I still have all these pieces and use them frequently, including the crappy paring knife. The sweet college student remarked how nice it was see a basic kit and realize that you can start simple. There is no starting simple in his book. And another thing… Michael Pollan have you been nowhere except NYC and Berkeley in all your years???? People in this country have accents, yay diversity! yay regionalism! "Mr. Pollan advocates a return to foods more like what our ancestors ate - locally grown, fresh and seasonal. The radical part is this requires leaving behind modern convenience food products and much of the industry that has developed to provide them." 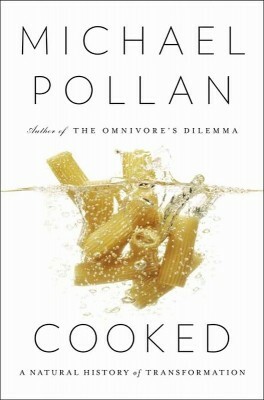 I had to laugh when I realized that Mr. Pollan was advocating that the rest of us should cook our meals seasonally and from scratch when his own cooking skills were quite limited. That aside, I enjoyed Cooked as a travelogue and exploration of cooking techniques beyond grilling, roasting and boiling. Four chapters; Fire, Water, Air and Earth, address the culinary arts of barbecue (slow smoking NOT grilling), braising, baking and fermentation (beer, pickling and cheese). Between EcoMommyo and I we have a fair bit of experience with braising, baking and beer making, so I was most interested in the art of slow-smoked barbecue, pickling and cheese making. While not focused on the how-to, Cooked has enough information to introduce you to each of these techniques and exhaustive footnotes if you care to learn more. I believe that being able to cook a meal from scratch is a vital life skill. I also agree with Mr. Pollan that cooking for yourself is more enjoyable and satisfying than paying someone else to do it for you. But, I don't think reading Cooked will bring any more people into the kitchen than has Rachel Ray.